A Lower Reference Nutrient Intake (LRNI): Meets the nutritional requirements of only 2.5% of the population. An Estimated Average Requirement (EAR): The average amount of nutrient or energy required. Approximately 50% of the population will require more and 50% will require less. Safe Intake (SI): Used in place of RNI when there is insufficient data available to set an RNI. A safe intake is likely to meet the needs of the majority of the population without causing any adverse effects of excess intake. Safe Upper Limit (SUL): The maximum amount of a nutrient known to be safe to intake. Habitually consuming nutrients above the SUL is not recommended and can cause toxic effects in some cases. Note: DRV’s are also known as NRV’s (Nutrient Reference Values – Aus/NZ) and DRI’s (Dietary Reference Intakes – USA). RNI’s are also known as RDI’s (Recommended Dietary Intakes) or RDA’s (Recommended Dietary Allowance). SI is also known as AI (Adequate Intakes). SUL’s are also known as UL (Tolerable Upper Intake Level)…just to keep it simple! 1. If an individual is routinely consuming the RNI for a particular nutrient, it can be assumed that their diet provides adequate amounts (or more than adequate amounts) of that nutrient. 2. If an individual is consuming less than the RNI, it cannot necessarily be assumed that the diet is inadequate, as the person may have a lower requirement than average for that particular nutrient. 3. If an individual is consistently consuming less than the LRNI for a nutrient, it can be assumed that the person is deficient in that particular nutrient, although this does not imply the person is clinically ill.
4.The DRV’s will apply to the needs of healthy people and it cannot be assumed that the needs of those who are ill or extremely active are identical. Choose which Dietary Reference Values you wish to use from the ‘DRV source’ drop down when setting up your client. 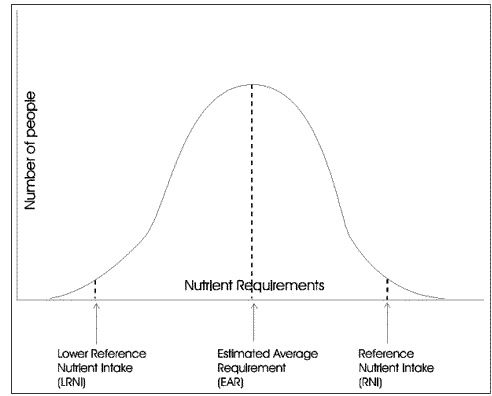 The target intakes and ranges for nutrients on the report will be based on this selection. There are numerous options from International sources built in to Nutritics. You can also set your own targets using the DRV editor (see custom DRV section). A Nutritics recommendation which combines macronutrient guidelines from American College of Sports Medicine (ACSM) with suggested dietary micronutrient targets for reducing the risk of developing chronic disease from the NHMRC. The Nutritics recommendations also show lower intake limits from the NNR and upper intake limits from the highest value deemed safe from the above authorities. The Food Safety Authority of Ireland (FSAI) 1999 guidelines have been deprecated in Nutritics 5.0 as of November 2017.